To succeed those that came before; to enlighten those that come after; to revere the ancient Taiji. The beginning taiji classes will be taught in a very slow pace to allow students to learn the basic theories of Chen taiji. This slow pace will enable students to learn the fundamental body alignment/movements in a mindfulness manner so they can achieve the "mind and body" health objectives. Great detail will be given on the basic standing and sitting Wuji Qigong (meditation) to help students learn how to align acupressure points to achieve optimal body posture to maximize internal energy flow and to "yang" nurture and cultivate the pre-natal "qi" (internal energy). In this class, I hope to open up the beginner students' hearts in accepting this new ancient art with a different perspective - how to use taiji to deal with our daily lives. Most importantly, I hope students will learn how to humble themselves to become a learner again. Fast and experienced learners are not encouraged to move ahead of the rest of the class as it might intimidate other students. This is a good class for those students to learn how to slow down and appreciate the opportunity to learn/practice with different kinds of people. I do not allow students in my classes to intrude into other students' space UNLESS you are being asked to help by the individual student or instructed by me to help and lead the group. Please be courteous, give room and time for others to learn and grow at their own pace. I encourage students who want to learn taiji for health benefits to come to my beginning classes. Taiji has helped me overcome some of my health ailments, such as "temporary" carpal tunnel syndrome, shoulder and knee injuries, and asthma. I tend to go out of my way to help beginner students to achieve a certain level as long as they are diligently attending my classes. Beginner students are encouraged to repeat the beginning classes as often as they wish, until they are comfortable to move on. I believe everyone deserves a chance to learn taiji to at least benefit from the health aspect. Students with special situations and/or conditions preventing them to learn from my normal slow pace beginning classes should talk or write to me in private to arrange special sessions to accommodate those situations. If you are interested in the complete Chen Family Taijiquan System and is considering whether to learn the martial art side of Chen taijiquan, please read on. My sifu's definition of Taijiquan is more than the "health-oriented, low impact exercises", as what is perceived today. Taiji and Taijiquan are two words that are interchangeably nowadays in the Taiji community. Taijiquan was invented as a martial art many generations ago. "Quan" literally means "fist" and implying martial art in the Chinese Martial Art Systems. I intend to teach most of my classes similar to how it was taught to me by my sifu, Chen Qingzhou. It is my sifu's goal to preserve this old ancient martial art and pass it down to the next generations "unchanged". It is also my goal to preserve this art and pass on the tradition. "It is hard to find a good teacher, but it is even harder to find a good student," my sifu told me. There are three conditions that must exist in order for a student to have a successful Taiji training. First, student must have a special love and interest in learning taiji. Second, there must be a good qualified teacher to teach you. Third, student's situation must permit him/her to learn diligently about the art without any disturbances. Do you really like taiji? Do you have the faith to learn from me? Do you have the time to learn it? Are you mentally ready to make yourself available for receiving my teaching? These are the questions you must ask yourself before you decide to "commit" to my advance classes. In my intermediate and advance classes, students are responsible for practicing on their own after each lesson. I expect students to catch up with the rest of the class if they have to miss a class. In the old days, martial art teachers normally pick out "good material" (students who are sharp, young, and strong) to teach and pass down their martial arts in hopes that these "good material" will turn out to be a good martial artists who will bring fame to the lineage and help spread the art. Weak, old, and slow students were denied the chance to learn taiji in many cases. I am definitely not one of those "bright students" and will never qualify as "good material" in the old days' standard. I view myself as a humble student of taiji and I hope to improve myself through interactions with my teachers, friends, classmates, and students. My sifu patiently and unconditionally taught me all he knew. I am so grateful to my sifu for instilling in me his teaching philosophy - "share this art with an open heart to everyone who sincerely comes to learn Chen Family Taiji. Taiji belongs to the world", my sifu said. I can still vividly remember the question Sifu Qingzhou asked us during our disciple ceremony. He asked, "tell me now, my student, have you ever regretted becoming my disciple and committing to my lineage?" Sifu asked each of us, one by one. "No," I answered. This is how Sifu cleared up my confusion and made me ready in receiving his teaching. This is an important attitude adjustment/training technique. This is how we make ourselves available for his teaching. "If I teach you the right thing, I am right; but if I teach you the wrong thing, I am still right" Sifu said. This is the kind of sifu-disciple relationship that generally exist when it comes to taiji. No doubt! No return! Sifu always reminded us, "Eating bitter or bitter practice" (practice diligently to the extreme point) is the essential factor to gain high level taiji. This is Sifu Qingzhou's teaching philosophy and I am committed to carrying on this kind of culture in my classes. It is the attitude of how we learn that enables us to accept the teaching. Intermediate and advance students will get more attention as they demonstrate they are diligently practicing and participating in regular class/group routines and trainings. Free special Sunday classes are offered each month to advance students who are certified and currently teaching 'Chen Taiji' and helping the school spread the art of Chen taiji. I offer free Sunday classes to these students/instructors as a token of my appreciation for their hard work in spreading the art. You can check the Class Description page to read the requirements on how to get certified as a Taiji Instructor by ACTS. 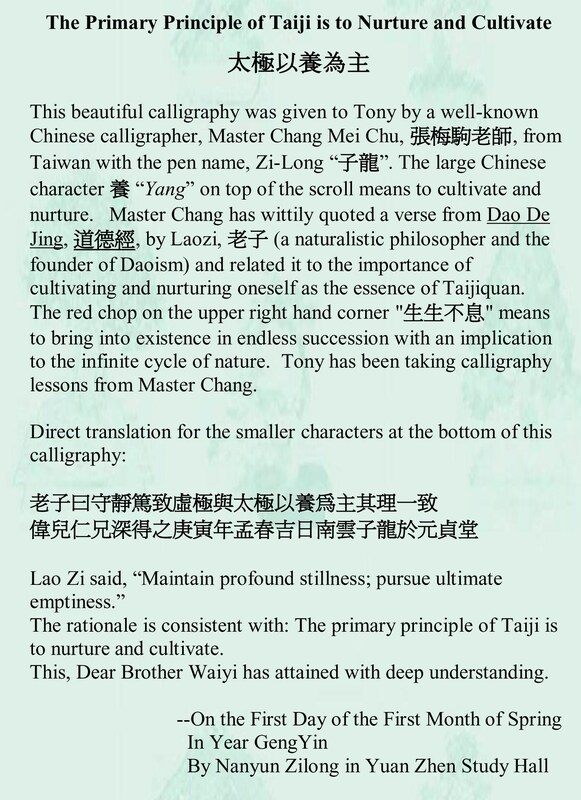 Students who have been with me for a while knew that I learned the Chen Tajji Xin Jia System(s) before I learned the Lao Jia System from Sifu Qingzhou. I believe it is important to preserve the Lao Jia Taijiquan System and pass on this art to the future generations. However, it is also important to study the evolution of this ancient art and understand how and why the Xin Jia was developed. I invite all of you to help to preserve the Lao Jia Taiji System that was passed down to us unchanged from Sifu Qingzhou, as well as to research and study the evolution of this system in the modern day environment. In addition to taiji, I also like to plant bonsai and orchid. A few of my students got into bonsai so they could mingle with me outside of taiji. One student told me she bought a small Trident maple to "train" it to become a bonsai. Without much thought, I casually told her a Trident maple is too common to train, and if she was really serious about spending so much time to train it, she should get a more "special" kind of maple to train. Ironically when I asked this student about the Trident maple a few months later, she told me she didn't care too much about the Trident maple anymore after I told her a Trident maple is too common and not a very special maple. This incident sadly reminded me so much of the "good material" that was selected in order to pass on the taiji art to achieve fame for the lineage of the old martial art schools. I went home and cut a few branches of my Trident maple and propagated it. Two of these Trident maples' branches grew and I "trained" them in hopes of giving this "trained" Trident maple to that student one day when it was ready, while hoping it wasn't too late to make a point to her. Sadly, she is no longer in my classes and this "trained" Trident maple reminds me of this student each time I care for it. Many good students come and go through my classes. Some of them stay because they have that three conditions as stated by my sifu to allow them to continue learning from me, but some of them leave because of "various" reasons. With my teaching philosophy in mind, I hope you will enjoy my classes. 3) Chinese or English version of the Qigong book you are requesting. I will bring the Wuji Qigong book to class for you upon receiving your email, which must include the information requested above. My email is: wongwaiyi@hotmail.com.